As far as Warriors rookies are concerned, why start losing now? The expectation is that the Golden State Warriors will finally lose a playoff game in the 2017 NBA Finals against LeBron James, Kyrie Irving and the reigning champion Cleveland Cavaliers. But until that loss comes, Warriors rookies Patrick McCaw and Damian Jones have only known winning in the postseason. “It’s my first time, and you always see the Finals on TV,” Jones told The Undefeated. “Actually, living it is awesome. We’re 12-0 right now. It’s crazy. This hasn’t happened. We’re going through history right now. It’s pretty fun. The 2017 Western Conference champion Warriors set an NBA record as the first team with a 12-0 start in the playoffs after sweeping through the first three rounds. The Warriors have won 27 of their past 28 games dating to the regular season, with the last loss coming on April 10 against the Utah Jazz. It will be quite difficult for the Warriors to finish this season unblemished against the Cavaliers, who are 12-1 in the playoffs entering the Finals. McCaw has played in 10 of the Warriors’ 12 playoff victories, while Jones has played in four. According to ESPN Stats & Information, the NBA record for best start by a rookie in the playoffs is held by forward Mark Madsen, who went 13-0 in 2001 with the NBA champion Los Angeles Lakers. McCaw could break Madsen’s record if the Warriors sweep the Cavaliers with him playing in each Finals win. Cleveland has one rookie on the roster in guard Kay Felder, who hasn’t played in a postseason game. McCaw and Jones are understandably stunned that they have a chance to be NBA champions as rookies, considering their road to the Warriors. McCaw watched the 2016 NBA draft at a packed party in his hometown of St. Louis as the Milwaukee Bucks selected him with the 38th overall pick in the second round. The Warriors acquired the draft rights to the former Nevada-Las Vegas star for $2.4 million that same night. After being very emotional when the Bucks selected him, McCaw got focused and motivated after being dealt to the NBA powerhouse Warriors. 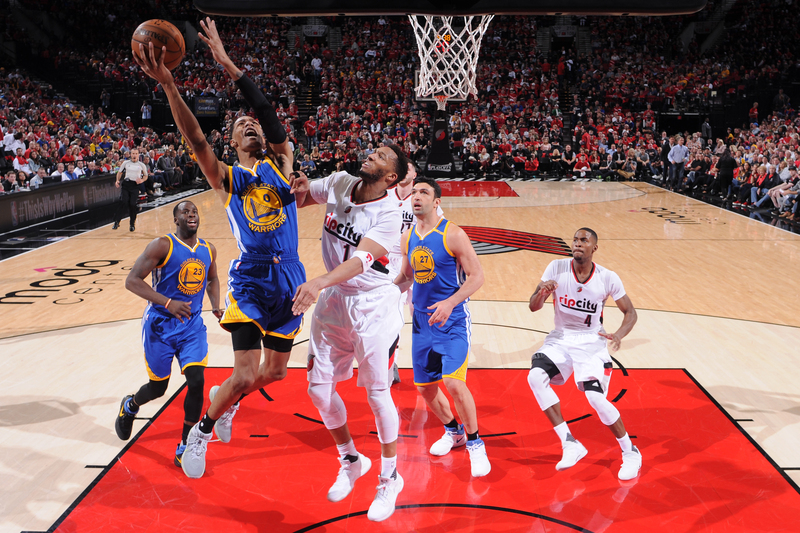 Patrick McCaw #0 of the Golden State Warriors shoots the ball against the Portland Trail Blazers in Game Three of the Western Conference Quarterfinals of the 2017 NBA Playoffs. “I was just crying that whole time when I got drafted,” McCaw said. “Playing in the NBA has always been my dream. About 30 minutes later after I finished crying, I figured out that I was going to Golden State, and I just got a jolt of energy. I am playing with Klay [Thompson] and Steph [Curry] and those guys? McCaw has also stood out among first-year players in what has been a lackluster year for the 2016 rookie class. The 6-foot-7, 185-pounder started in 20 of his 71 regular-season games played, averaging 6.3 points, 2.4 rebounds and 1.9 assists. McCaw has also started three postseason games and is averaging 5.0 points, 2.3 rebounds and 1.4 assists. He started in the Warriors’ Western Conference-clinching Game 4 win over the San Antonio Spurs on May 22, earning six points, four rebounds and two assists during a 129-115 win. “It’s unreal, to be honest,” McCaw said. “I go day by day with what is going on. Right now, in this moment, I still can’t believe it. All this is like a dream unfolding right in front of me. Jones could eventually be a steal for the Warriors, as the ex-Vanderbilt center was considered a possible top 20 draft prospect before suffering a torn pectoral muscle during a weightlifting workout with the Orlando Magic. 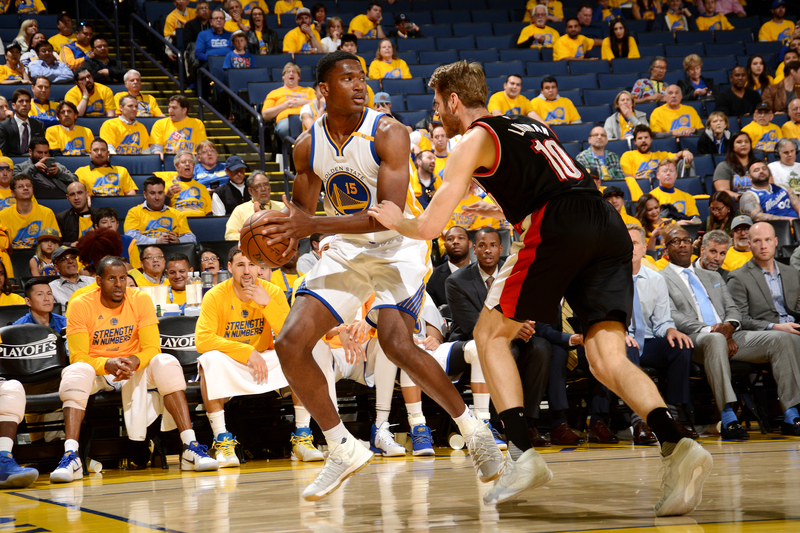 Damian Jones #15 of the Golden State Warriors handles the ball during the game against the Portland Trail Blazers during Game Two of the Western Conference Quarterfinals during the 2017 NBA Playoffs. The two-time All-Southeastern Conference selection was the 30th overall pick in the 2016 NBA draft. The athletic 7-foot, 245-pounder made his professional debut with the Warriors’ D-League team in Santa Cruz, California, after missing the first 13 NBA games. The Baton Rouge, Louisiana, native played sparingly for the Warriors after making his NBA debut on Feb. 10. The D-League Player of the Month for March and April, however, did show promise by averaging 11.3 points on 58.3 shooting from the field, 7.2 rebounds and 2.1 blocks per game in 31 contests with Santa Cruz. Jones has played spot minutes in four of the Warriors’ postseason games. Not only are McCaw and Jones undefeated in the playoffs, but they have not had to deal with embarrassing rookie hazing. The duo has not had to wear Barbie backpacks, had their cars filled with buttered popcorn or been taped to a rolling chair while being pushed down the court by Zaza Pachulia, Draymond Green or David West. With hazing typically of the food-delivery variety, McCaw said, he and Jones have been lucky so far. “There was nothing really except for bringing stuff to the plane like coffee, maybe Jamba Juice, Chipotle, playing cards, and that was really it,” McCaw said. “We rotated bringing it, or did it together. But nothing really crazy. I remember going to New Orleans for the second time this season and the guys came in and dumped water on me on my [hotel] bed. That was the worst thing.